HINDU RITUALS AND ROUTINES...: What Do The Three Strands Of The Sacred Thread Represent? The word Upanayan consists of two words, upa and nayan. ‘Upa’ means near and ‘nayan’ means to take towards. In short, Upanayan means taking to the Guru (teacher), who will teach the Gayatri mantra. Nayan also means ‘the eye’. Upanayan thus means the inner vision (antahachakshu). 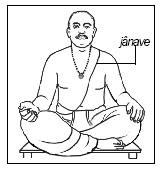 Therefore that rite which facilitates the development of inner vision is called Upanayan. Vratabandha is that rite by which one is bound by restrictions of vowed religious observances (vrat), norms of Righteousness (Dharma) and celibacy. Before that, there are no restrictions on the child’s behaviour. Upanayan is also named Munja after the grass ‘munja’ which is tied to the waist during the rite. Every human being is born a Shudra, that is he just learns how to clean himself physically. However, by performing rites (karma) he is reborn (dvij). ‘Dvi’ means two, that is second time and ‘j’ means to be born. Since due to the thread ceremony the boy has a kind of rebirth he is said to become twice born (dvij). The second birth of a celibate (brahmachari) is marked by the rite of the thread ceremony. It is symbolized by wearing a girdle of munja grass. In this birth, Savitri is supposed to be his mother and Acharya (the teacher) his father. (Manusmruti 2.170). Once he becomes twice born he becomes worthy of chanting the Gayatri mantra, that is qualified to do spiritual practice; hence performing the thread ceremony is a must, while marriage is not. The three cords are tied together by a knot called Brahma-granthi, which symbolises Brahma, Vishnu and Siva (the trinity of gods, Creator, Sustainer and Destroyer). The sacred thread is held in the hand and chanting the Gayatri mantra ten times, is sprinkled with water charged with mantras. This endows it with the tej (absolute fire) element. The boy is then asked to wear it. Yadnyopavit is a word consisting of two words, yadnya and upavit. Vit means that which is woven, that is cloth and upavit means the upper garment. One is born naked. Then the baby is kept wrapped in one garment. Till the thread ceremony is performed the boy can remain clad in one garment. The use of the upper garment begins after the thread ceremony. After the thread ceremony one garment refers to the loin cloth (langoti) and the second (upper) garment to the sacred thread (janave) which is in a way a condensed form of the shawl on the shoulder (uparne). The sacred thread is made up of nine fibres. One deity is established in each fibre as follows. 1. Omkar, 2. Agni (deity of fire), 3. Nag (serpent), 4. Som (moon), 5. Pitar (ancestors), 6. Prajapati (deity of procreation), 7. Vayu (air), 8. Yama (deity of death) and 9. Vishvadevata (deity of the universe). Three strands are created by twisting three of the nine fibres in each strand. The three Vedas - Rugveda, Yajurveda and Samaveda are established on each of these strands. Three fibres are woven into one strand and the three strands are then knotted together. This knot is called the Brahmagatha (gatha means a knot) or the Brahmagranthi (granthi means a gland). [The knot of sacred grass (darbha) tied to a gold ring (pavitrak) is also called a Brahmagranthi.] It is the site of establishing the Atharvaveda. This knot is extremely important and one requires skill to tie it. The three strands represent the three stages (ashrams) - celibate student (brahmacharya), the married householder (gruhastha) and retired householder (vanaprastha); the three fires, the fire worshipped in the home (garhapatya), the fire placed in the south (dakshinagni) and the sacred fire lit for a specific spiritual purpose (ahvaniya) as well as spiritual knowledge (dnyan), devotion (bhakti) and action (karma). The one who possesses all these three qualities gets the spiritual experience of Brahman. Based on 96 items listed below, the length of the sacred thread should be 96 times the breadth of a finger (angul). Meaning: 15 auspicious dates (tithis) + 7 days of the week + 27 lunar asterisms + 25 principles + 4 Vedas + 3 components (gunas) + 3 time periods (kals) + 12 months = 96. Thus, the length of the sacred thread (yadnyopavit) is 96 times the breadth of a finger (angul). In the Shaiva sect, the three strands of the sacred thread represent the three horizontal lines of holy ash (tripundra) on the forehead of Lord Shankar which symbolize spiritual knowledge (dnyan), purity and penance (tapashcharya). The Brahmagath indicates the origin of these three, that is divine consciousness (chaitanya). The celibate (brahmachari) and ascetic (yati) should wear one and the married householder (gruhastha) and the retired householder (vanaprasthi) should wear two sacred threads. One thread indicates that an ascetic and a celibate are concerned only with their own spiritual progress while two threads in the married householder and the retired householder indicate that they are also responsible for the spiritual progress of their wives besides their own. Meaning: In ancient times (kalpa) thread ceremony for women was recommended. Either the father, paternal uncle or brother would impart knowledge to the girl. However, other men were prohibited from doing this task. A celibate girl (brahmacharini) would ask for alms in her own household. Manu (2.66) states that the thread ceremony in girls was performed without a mantra. From this, it appears that since Manu’s times this custom slowly started declining. What is the motive behind placing the sacred thread over the right ear lobe during urination or defaecation? 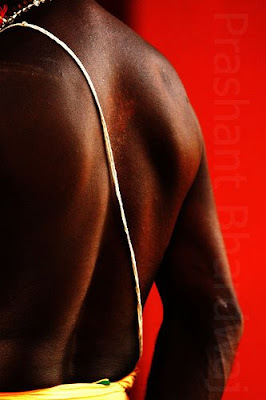 In short, it means that since the part of the body above the navel is considered pure and that below it impure, during urination and defaecation the sacred thread is worn as a chain (nivit) around the neck and is placed on the right ear. The scriptures often mention the importance of the right ear. Since it is the seat of various deities like Aditya, Vasu, Rudra, Vayu, Agni, Dharma, Veda, Apa, Som, Surya, Anil, etc. mere touch of the right ear bears the benefit of the ritual of sipping water from the palm (achaman). Thus by placing the sacred thread on the right ear which is pure, one is not bound by the restrictions of impurity. cute boy in the second pic!!! !